If ever there was a legend that could truly span the ages, it would be that of Faust. Be it from a religious or personal perspective, the act of selling oneself to achieve greatness is an allegory that opens the doors to an infinite assortment of moral dilemmas. On the basic, eldest level, plays and writings based on Faust deal with a man selling his soul to the devil for his own gain, even if that gain is for the betterment of the people. Perhaps the most acknowledge version of the legend can be attributed to Goethe, but in the early days of film, accomplished Nosferatu director F.W. Murnau changed key plot points (and omitted an act) and compressed the rest into an early expressionist masterwork of cinematography, lighting and special effects. The portals of darkness have been opened and evil has invaded the world. An archangel (Werner Fuetterer) is wagered by the devil Mephisto (Emil Jannings) that he can tempt the kind old alchemist, Faust (Gösta Ekman) to the darkside. The angel agrees and the devil immediately goes to work, spreading famine, war and the Plague throughout a small town. Faust goes to work on a cure, but comes up with nothing. He seeks refuge in the Lord in hopes that his intervention could save the townsman from certain death. Faust's prayers for a cure go unanswered and he becomes belligerent, burning all of his texts and prayer books. As the fire cuts through the pages, one of his holy books opens up to a verse that tempts Faust. It informs him to go to a crossroads and summon the Lord of darkness and all he wants will be his. Still infuriated, Faust chants the devil’s name three times at the crossroads and is met by Mephisto. He fears this demon, so he flees only to be followed each step of the way. Mephisto kindly offers Faust a 24-hour trial period of infinite power, no strings attached. If he so chooses, after the hourglass is spent, he will either go about life as an old man in a Plague ravaged town or sell his soul to him for eternity. Faust accepts and immediately heads out to the streets to cure the townsfolk. It’s proclaimed a miracle until a woman shows Faust a crucifix, which he can't bear since he's in a deal with the devil. The townsfolk stone him and Faust retreats to his home where Mephisto shows him the most beautiful woman he’s ever seen and takes him to her. 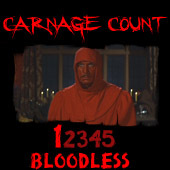 As Faust is about to get his greatest pleasure, the hourglass empties and it’s for him to decide his eternal fate… inked in blood. There is perhaps no greater example of a true nightmare than those captured in the faultless, chilling visions of Faust. This directorial masterpiece is so far ahead of its time that few films to this day have caught up with the striking visuals, apposing use of light and darkness and quite literally groundbreaking, iconic sequences. It is such in films as this, Ingmar Bergman’s The Seventh Seal and Jacques Tourneur’s I Walked with a Zombie where the power of black and white photography truly excels. Not in the sense that the world is greyscale, but the furious impact on the viewer that extreme blackness and vivid lighting accompanied by amazing shadowy depth can accomplish. Whereas many black and white films could be seen as simply lacking color, these shining examples prove that when done properly, black and white photography can go to a surreal, nightmarish world beyond anything color photography has ever achieved. The opening 50 minutes of Faust can rival many of the greatest films ever made. Many horror fans I’ve spoken to perceive Dario Argento’s Suspiria to be the most nightmarish movie ever filmed. I never was one to wholly agree with this, but if there ever were one to challenge the words of even the most diehard Argento fan, it’d be this F.W. Murnau classic. I thought Nosferatu was visually powerful, but Faust tromps it in ever way possible. Predating Armando de Ossorio’s Tombs of the Blind Dead by nearly 50 years, Murnau opens the film with the vision of skeletal demons branding weapons and riding on cadaverous beasts amidst clouds of smoke through the wind. Immediately, you know you’re about to witness something powerful and perplexing, the type of film that makes you proud to be a horror fan. Following this is an epic bit of dialogue between ultimate forces of good and evil, which leads to the ghastly image of the gargantuan sized devil hovering over a small town, spreading his wings and unleashing the Plague onto the citizens. To achieve these effects, small models were used and at times they are obvious, but you aren’t likely to care. This art is accomplished with such skill of the craft that you truly believe what you are witnessing is real. One could go on for paragraph after paragraph about the astonishment Murnau brings to your senses, but there’s a good story to be had as well. Faust selling his soul to the devil quickly leads astray from his normally pleasant and God-fearing nature into a life of sin. But, Faust can not merely be satisfied with the flesh and greed, he eventually longs for his old life. Returning to his old town, he encounters a virginal beauty named Gretchen whom he must have. Eventually, he brings her innocence into his tragic world and she pays the most heart wrenching of prices. It’s an important element of the plot that plays out differently than Goethe’s ideas and probably is makes the film slightly lesser for it. The true-love angle gets a bit played out over the course of about half hour before the film reverts back into the engaging elements that made the beginning so epic. To go along with the perfect direction, the acting is stellar and the special effects are way ahead of anything you’d see in the later Universal talkies that paved the way for what horror would become. The Spanish version of Universal’s Dracula has gained acclaim since discovery for improving greatly on the effects and risqué nature of characters than the Lugosi counterpart, but compared to Faust, it’s twice as bland as the original Drac (which, being a Lugosi fan, I still cherish). It’s actually quite amazing how long it took artists to catch up (if they ever did) to what Murnau had accomplished in the twenties. Of interesting note to me, Murnau’s vision of hell is akin to Lucio Fulci’s in The Beyond, allowing drab eeriness to provide the background for never-ending torture of regret. 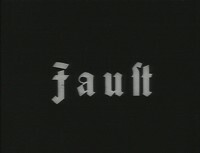 Kino released Faust on DVD in its 116 minute version, which is truer to the original intent than the version released in the US. It is of note that Faust will be making another appearance on DVD from Kino and will include the version reviewed here as well as the American version for roughly the same price. The image is cleaned up extraordinarily well for a silent film, but there are plenty of scratches and blemishes that add to the feel of the movie. The orchestral soundtrack is presented in stereo and it is clear and great as well. Faust is a tragic morality tale with stunning imagery that you’re certain never to forget for as long as a signature in blood cements one's life after death. To put it bluntly, Faust is unforgettable. Essential!